For other uses, see Laika (disambiguation). In 1957, Laika became the first animal launched into orbit, paving the way for human spaceflight. This photograph shows her in a flight harness. Laika (Russian: Лайка;[lower-alpha 1] c. 1954 – November 3, 1957) was a Soviet space dog who became one of the first animals in space, and the first animal to orbit the Earth. Laika, a stray dog from the streets of Moscow, was selected to be the occupant of the Soviet spacecraft Sputnik 2 that was launched into outer space on November 3, 1957. Little was known about the impact of spaceflight on living creatures at the time of Laika's mission, and the technology to de-orbit had not yet been developed, and therefore Laika's survival was not expected. Some scientists believed humans would be unable to survive the launch or the conditions of outer space, so engineers viewed flights by animals as a necessary precursor to human missions. The experiment aimed to prove that a living passenger could survive being launched into orbit and endure micro-gravity, paving the way for human spaceflight and providing scientists with some of the first data on how living organisms react to spaceflight environments. On April 11, 2008, Russian officials unveiled a monument to Laika. A small monument in her honour was built near the military research facility in Moscow that prepared Laika's flight to space. It features a dog standing on top of a rocket. She also appears on the Monument to the Conquerors of Space in Moscow. After the success of Sputnik 1 in October 1957, Nikita Khrushchev, the Soviet leader, wanted a spacecraft launched on November 7, 1957, the 40th anniversary of the Bolshevik Revolution. Construction had already started on a more sophisticated satellite, but it would not be ready until December; this satellite would later become Sputnik 3. Meeting the November deadline meant building a new craft. Khrushchev specifically wanted his engineers to deliver a "space spectacular", a mission that would repeat the triumph of Sputnik 1, stunning the world with Soviet prowess. Planners settled on an orbital flight with a dog. Soviet rocket engineers had long intended a canine orbit before attempting human spaceflight; since 1951, they had lofted 12 dogs into sub-orbital space on ballistic flights, working gradually toward an orbital mission set for some time in 1958. To satisfy Khrushchev's demands, they expedited the orbital canine flight for the November launch. According to Russian sources, the official decision to launch Sputnik 2 was made on October 10 or 12, leaving only four weeks to design and build the spacecraft. Sputnik 2, therefore, was something of a rush job, with most elements of the spacecraft being constructed from rough sketches. Aside from the primary mission of sending a living passenger into space, Sputnik 2 also contained instrumentation for measuring solar radiation and cosmic rays. The craft was equipped with a life-support system consisting of an oxygen generator and devices to avoid oxygen poisoning and to absorb carbon dioxide. A fan, designed to activate whenever the cabin temperature exceeded 15 °C (59 °F), was added to keep the dog cool. Enough food (in a gelatinous form) was provided for a seven-day flight, and the dog was fitted with a bag to collect waste. A harness was designed to be fitted to the dog, and there were chains to restrict her movements to standing, sitting, or lying down; there was no room to turn around in the cabin. An electrocardiogram monitored heart rate and further instrumentation tracked respiration rate, maximum arterial pressure, and the dog's movements. Laika was found as a stray wandering the streets of Moscow. Soviet scientists chose to use Moscow strays since they assumed that such animals had already learned to endure conditions of extreme cold and hunger. This specimen was an eleven-pound mongrel female, approximately three years old. Another account reported that she weighed about 6 kg (13 lb). Soviet personnel gave her several names and nicknames, among them Kudryavka (Russian for Little Curly), Zhuchka (Little Bug), and Limonchik (Little Lemon). Laika, the Russian name for several breeds of dogs similar to the husky, was the name popularized around the world. The American press dubbed her Muttnik (mutt + suffix -nik) as a pun on Sputnik, or referred to her as Curly. Her true pedigree is unknown, although it is generally accepted that she was part husky or other Nordic breed, and possibly part terrier. NASA refers to Laika as a "part-Samoyed terrier." A Russian magazine described her temperament as phlegmatic, saying that she did not quarrel with other dogs. Vladimir Yazdovsky, who led the program of test dogs used on rockets, in a later publication wrote that “Laika was quiet and charming”. The Soviet Union and United States had previously sent animals only on sub-orbital flights. Three dogs were trained for the Sputnik 2 flight: Albina, Mushka, and Laika. Soviet space-life scientists Vladimir Yazdovsky and Oleg Gazenko trained the dogs. To adapt the dogs to the confines of the tiny cabin of Sputnik 2, they were kept in progressively smaller cages for periods of up to 20 days. The extensive close confinement caused them to stop urinating or defecating, made them restless, and caused their general condition to deteriorate. Laxatives did not improve their condition, and the researchers found that only long periods of training proved effective. The dogs were placed in centrifuges that simulated the acceleration of a rocket launch and were placed in machines that simulated the noises of the spacecraft. This caused their pulses to double and their blood pressure to increase by 30–65 torr. The dogs were trained to eat a special high-nutrition gel that would be their food in space. Before the launch, one of the scientists took Laika home to play with his children. In a book chronicling the story of Soviet space medicine, Dr. Vladimir Yazdovsky wrote, "I wanted to do something nice for her: She had so little time left to live." Vladimir Yazdovsky made the final selection of dogs and their designated roles. Laika was to be the "flight dog"—a sacrifice to science on a one-way mission to space. Albina, who had already flown twice on a high-altitude test rocket, was to act as Laika's backup. The third dog Mushka was a "control dog"—she was to stay on the ground and be used to test instrumentation and life support. Before leaving for the Baikonur Cosmodrome, Yazdovsky and Gazenko conducted surgery on the dogs - they routed the cables from the transmitters to the sensors that would measure breathing, pulse, and blood pressure. Because the existing airstrip at Turatam near the cosmodrome was small, the dogs and crew had to be first flown aboard a Tu-104 plane to Tashkent. From there, a smaller and lighter Il-14 plane took them to Turatam. Training of dogs continued upon arrival; one after another they were placed in the capsules to get familiar with the feeding system. According to a NASA document, Laika was placed in the capsule of the satellite on October 31, 1957—three days before the start of the mission. At that time of year the temperatures at the launch site were extremely cold, and a hose connected to a heater was used to keep her container warm. Two assistants were assigned to keep a constant watch on Laika before launch. Just prior to liftoff on November 3, 1957 from Baikonur Cosmodrome, Laika's fur was sponged in a weak alcohol solution and carefully groomed, while iodine was painted onto the areas where sensors would be placed to monitor her bodily functions. One of the technicians preparing the capsule before final liftoff states that "after placing Laika in the container and before closing the hatch, we kissed her nose and wished her bon voyage, knowing that she would not survive the flight." The exact time of the liftoff varies from source to source and is mentioned as 05:30:42 Moscow Time or 07:22 Moscow Time. At peak acceleration Laika's respiration increased to between three and four times the pre-launch rate. The sensors showed her heart rate was 103 beats/min before launch and increased to 240 beats/min during the early acceleration. After reaching orbit, Sputnik 2's nose cone was jettisoned successfully; however the "Block A" core did not separate as planned, preventing the thermal control system from operating correctly. Some of the thermal insulation tore loose, raising the cabin temperature to 40 °C (104 °F). After three hours of weightlessness, Laika's pulse rate had settled back to 102 beats/min, three times longer than it had taken during earlier ground tests, an indication of the stress she was under. The early telemetry indicated that Laika was agitated but eating her food. After approximately five to seven hours into the flight, no further signs of life were received from the spacecraft. The Soviet scientists had planned to euthanize Laika with a poisoned serving of food. For many years, the Soviet Union gave conflicting statements that she had died either from asphyxia, when the batteries failed, or that she had been euthanized. Many rumors circulated about the exact manner of her death. In 1999, several Russian sources reported that Laika had died when the cabin overheated on the fourth day. In October 2002, Dimitri Malashenkov, one of the scientists behind the Sputnik 2 mission, revealed that Laika had died by the fourth circuit of flight from overheating. According to a paper he presented to the World Space Congress in Houston, Texas, "It turned out that it was practically impossible to create a reliable temperature control system in such limited time constraints." Over five months later, after 2,570 orbits, Sputnik 2—including Laika's remains—disintegrated during re-entry on April 14, 1958. NASA named this soil target on Mars after Laika during the Mars Exploration Rover mission. Due to the overshadowing issue of the Soviet vs. U.S. Space Race, the ethical issues raised by this experiment went largely unaddressed for some time. As newspaper clippings from 1957 show, the press was initially focused on reporting the political perspective, while the health and retrieval—or lack thereof—of Laika only became an issue later. Sputnik 2 was not designed to be retrievable, and Laika had always been intended to die. The mission sparked a debate across the globe on the mistreatment of animals and animal testing in general to advance science. In the United Kingdom, the National Canine Defence League called on all dog owners to observe a minute's silence, while the Royal Society for the Prevention of Cruelty to Animals (RSPCA) received protests even before Radio Moscow had finished announcing the launch. Animal rights groups at the time called on members of the public to protest at Soviet embassies. 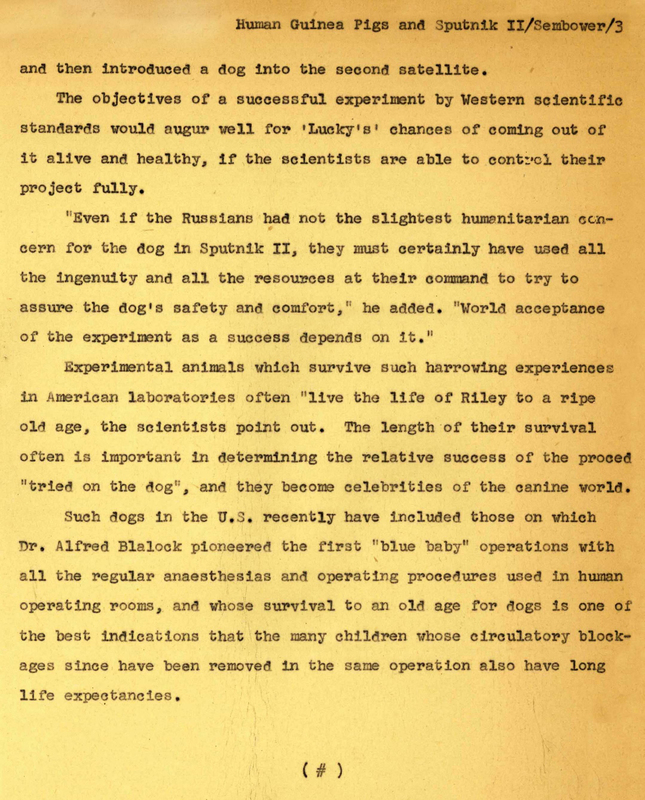 Others demonstrated outside the United Nations in New York; nevertheless, laboratory researchers in the U.S. offered some support for the Soviets, at least before the news of Laika's death. Work with animals is a source of suffering to all of us. We treat them like babies who cannot speak. The more time passes, the more I'm sorry about it. We shouldn't have done it ... We did not learn enough from this mission to justify the death of the dog. In other Warsaw Pact countries, open criticism of the Soviet space program was difficult because of political censorship; however, there were notable cases of criticism in Polish scientific circles. A Polish scientific periodical, "Kto, Kiedy, Dlaczego", published in 1958, discussed the mission of Sputnik 2. In the periodical's section dedicated to astronautics, Krzysztof Boruń described not bringing Laika back to Earth alive as "regrettable" and "undoubtedly a great loss for science". Laika is memorialized in the form of a statue and plaque at Star City, Russia, the Russian Cosmonaut training facility. Created in 1997, Laika is positioned behind the cosmonauts with her ears erect. The Monument to the Conquerors of Space, constructed in 1964, also includes Laika. On April 11, 2008 at the military research facility where staff had been responsible for readying Laika for the flight, officials unveiled a monument of her poised on top of a space rocket. Future space missions carrying dogs would be designed to be recovered. Four other dogs died in Soviet space missions: Bars and Lisichka were killed when their R-7 rocket exploded shortly after launch on July 28, 1960; Pchyolka and Mushka died when Korabl-Sputnik 3 was purposely destroyed with an explosive charge to prevent foreign powers from inspecting the capsule after a wayward atmospheric reentry trajectory on December 1, 1960. ↑ Laika, literally meaning "Barker" in Russian, is also a generic name for several dog breeds. Siddiqi, Asif. A. (2000), Challenge to Apollo: The Soviet Union and the Space Race, 1945-1974, NASA <templatestyles src="Module:Citation/CS1/styles.css"></templatestyles> SP-2000-4408. Part 1 (page 1-500), Part 2 (page 501-1011). Angliss, Sarah and Uttley, Colin. Science in the Dock: The man who trained the space dogs. Retrieved January 28, 2005. Dubbs, Chris and Burgess, Colin. Animals In Space: From Research Rockets to the Space Shuttle, 2007. Wikimedia Commons has media related to Laika. This page was last modified on 5 January 2016, at 14:23.